Over the last 6 months I have used Google Docs more and more. I love the fact they are web-based (so not dependent on saving a document on my computer) and I love the ability to share a document and allow others to edit it if needed. A few days ago, on the Google Blog, they announced some of the recent upgrades to Google Docs that are pretty exciting. 1. 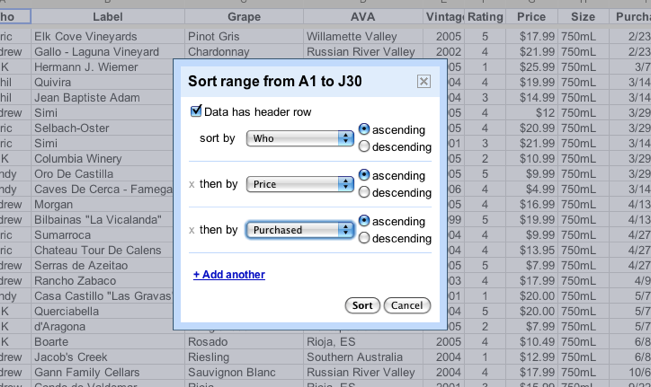 Advanced sorting in Google spreadsheets. Rather than sorting an entire worksheet by values in a single column, you can now sort any range of cells and sort by the contents of multiple columns. 2. Formula highlighting in Google spreadsheets. Google made it easier to write formulas in the new version of Google spreadsheets by adding visual indicators to show which cells a particular formula references. These color-coded highlights will help you keep track of your formulas at a glance. This feature works with Google Chrome, Safari and Internet Explorer; Firefox support is coming soon. The new version of Google documents also got a few upgrades last week, including improvements to make finding content in your documents, applying text styles and linking to sections within your documents with bookmarks faster and easier. 4. Google Apps Migration for Microsoft Outlook®. Google offers an array of migration tools to help businesses move email, calendar and contacts data from their old systems to Google’s cloud. Customers have used these utilities to migrate more than 2 billion email messages to Google’s cloud, and last week they introduced the new Google Apps Migration tool for Microsoft Outlook®. This is a new end-user tool that moves email, calendar and contact data from Outlook® profiles, PST files and Exchange accounts to Google Apps. Are you using Google Docs? How do you feel about working from the “cloud?” Would love your feedback, leave me a comment below!